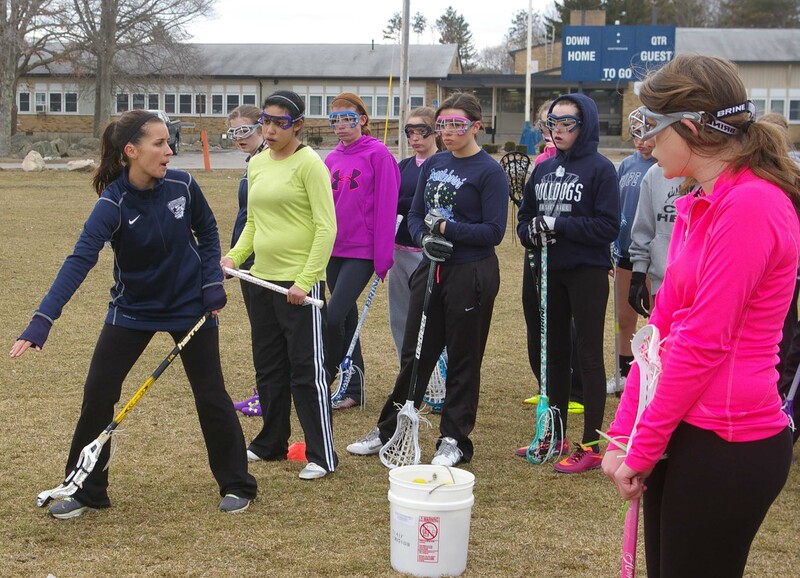 Ms. Rizzotti teaches her lacrosse players a skill. At RHS for the first time ever a girls’ lacrosse team is finally being offered as a spring sport. There hasn’t been a girls lacrosse team at RHS in past years because it wasn’t supported by the youth. Just recently the youth started a kindergarten through eighth grade lacrosse teams and in the spring 2013 the first boys’ lacrosse team was formed at RHS. People at RHS never really considered a girls’ lacrosse team to be an option, but now that it is everyone is excited. The teacher taking on the first ever girls’ lacrosse team is Ms. Rizzotti, a first year math teacher who played lacrosse at St. Martin’s College. Rizzotti says the main reason for starting a girls’ lacrosse team is “my students coaxing me into it.” Rizzotti has a lot of experience in lacrosse as she started playing in seventh grade and just picked it up easily and stuck with it. Colleen Burke, a freshman at RHS, never expected to play lacrosse in high school. She says that she “never thought I would have the opportunity to play lacrosse.” Burke is very excited for the upcoming season. She has always heard about how much people loved to play lacrosse and that it was a great sport to learn. Ever since her cousin started to play she’s wanted to play too. Burke has never played lacrosse before but is optimistic and can’t wait for the season to start and to pick up her lacrosse stick. All the girls on the spring lacrosse team have never played before. When starting a new sport the athletes must have patience and the will to try and learn. With a new sport there comes a lot of training and hard work. It’s “harder to pick up the older you start,” says Rizzotti. The team this year will open up a lot of opportunities for the players and for the school as well and Coach Rizzotti says that she can’t wait to see what the future hold for RHS girls lacrosse.